Join us for an afternoon of adventure and celebration on the conserved lands at Bolton. Explore the trails with the organizations that worked to conserve this property. 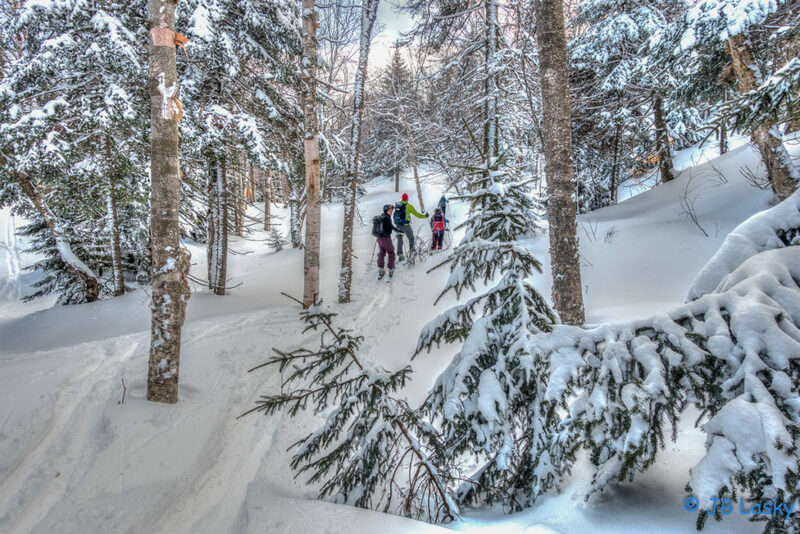 The Vermont Land Trust, Friends of Bolton Valley Nordic & Backcountry, Catamount Trail Association, and Green Mountain Club will lead you on snowshoe and ski tours. (Pre-registration required.) This event is $20 for adults and free for children 12 and under, plus any costs associated with rentals. A Bolton trail pass will be given to participants as part of the fee. You will have an opportunity to become a member of any of the sponsoring organizations at the event. You may register for one of these when you sign up for the event. All tours begin at various start times (check tour descriptions below for your start time). Please plan to arrive at least 15 minutes before your scheduled tour to register, obtain your trail pass from the Bolton Backcountry and Nordic Sports Center, get your gear in order, and meet your group. All tours will return to the Nordic Center around 3:00 pm for après ski celebrations. Join a two-hour guided tour of the beginner Bolton backcountry trails. All levels. Departing at 1 PM. A two-hour backcountry tour to a selection of easier Bolton glades and some lesser-used trails. Departing at 1 PM. Participants should be advanced skiers comfortable with making off-trail tele turns. This trip will be close to three hours. For this tour, please arrive by noon and be ready to head out by 12:30 PM. Join a tour combining flats, straight-up hills, slight inclines, and knee-bending downhills. Course will include ungroomed trails. Exact route to be determined based on participant skills and input. Departing at 1:30 PM. Join us back at the Nordic Center at 3 pm for tasty appetizers prepared with local ingredients by the chefs at Bon Temps Gourmet and listen to the musical talents of bluegrass band Two Cents in the Till! Questions? Contact Shelly Weeks at (802) 262-1201.